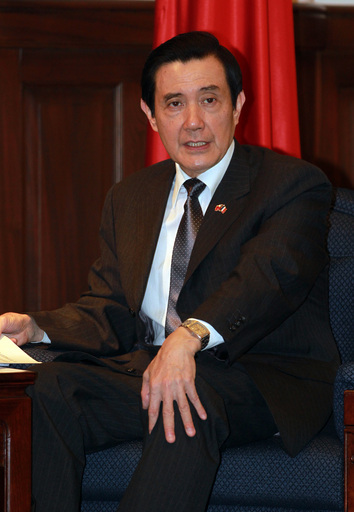 Taipei, May 23 (CNA) President Ma Ying-jeou said Thursday that the Republic of China is a peace-loving country and it is not seeking to flex its military muscles. "While we have to take measures to protect our fishermen operating within our 200-nautical mile exclusive economic zone, none of these actions should be misconstrued as military exercises or flexing our military muscles," Ma said while receiving the French representative to Taipei at the Presidential Office. Ma was referring to a maritime exercise in an area close to the overlapping waters of Taiwan and the Philippines' exclusive economic zones (EEZs) May 16 that involved Navy, Air Force and Coast Guard Administration personnel. Some foreign reports have described the drill as a move by Taiwan to flex its muscles in its current row with the Philippines over the shooting death of a Taiwanese fisherman by Philippine marine patrol personnel May 9. Ma told Olivier Richard, director of the French Institute in Taipei, that Taiwan has been more than willing to promote interaction and cooperation with neighboring countries. In April, he said, the ROC signed a fishery agreement with Japan to reduce fishing disputes in waters around the Diaoyutai Islands in the East China Sea, to which the two countries both lay sovereignty claims. "For Taiwan and Japan, it was the most important agreement signed over the past four decades because it touched on the sensitive territorial issue," Ma said. The agreement not only offers better protection for fishermen from both sides but has also helped ease tensions in the East China Sea, Ma said. "I believe the accord was something that the international community liked to see," the president added. In contrast, he said, the strafing of a Taiwanese fishing boat, the Kuang Ta Hsing No. 28, by a Philippine patrol ship in overlapping waters of the two countries' EEZs was an unfortunate incident. Ma said the Philippines should take responsibility for the death of the 65-year-old Taiwanese fishermen and the damage to the fishing boat, but added that the two countries are still negotiating the issue. Meanwhile, Taiwan has imposed retaliatory measures against the Philippines, as Manila has not responded satisfactorily to its demand for a formal apology, compensation for the victim's family, punishment of those responsible and a commitment to talks on a bilateral fishery pact, the president said. "We earnestly hope that the Philippines will respond to our requests as soon as possible so that the matter can be resolved soon," Ma said. The president also noted that the European Parliament has sent delegations to Taiwan on many occasions to promote the signing of an economic cooperation agreement between Taiwan and the European Union. With relations between Asia and Europe developing rapidly in recent years, Ma said, he hopes the EU will sign an economic partnership accord with Taiwan, following the EU's free trade pact with South Korea. On the EU's hope that Taiwan will open its market wider to European products, including farm produce and poultry products, Ma said Taiwanese officials have visited major European countries to study their agricultural markets in preparation for further market liberalization.